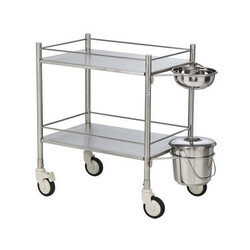 Prominent & Leading Manufacturer from Hyderabad, we offer dressing trolley with bowl and bucket, crash cart, crash cart trolley, baby crib trolley with stand and motorized birthing bed. Frame Stainless STeel Square/Round Tubes of 25 x 25 mm. Two stainless steel bowl dia 345mm bucket dia 360mm. 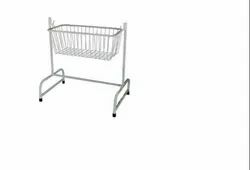 Available in full stainless steel/powder coated frame with stainless steel shelves & railings. Top trays for monitor & pulse oxymeter. System mounted on 100mm dia castors two with brake. Upper two drawer with medicine containers. Available in full stainless steel/powder coated frame with stainless steel top. CRCA tubular frame work.4 Nos of 100mm dia. castor wheels, two of them with breaks,diagonally fitted. 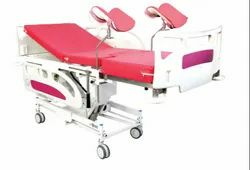 Overall approx size: L 2040MM x W 1015mmHeight adjustment: Min 530mm without mattress,Max: 860mm without mattressSafe working load: 200kgStainless steel telescopic IV rodPre treated & epoxy powder coated. 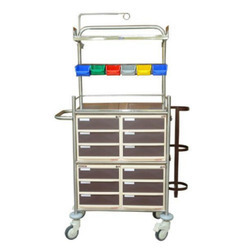 Looking for Crash Cart Trolley ?